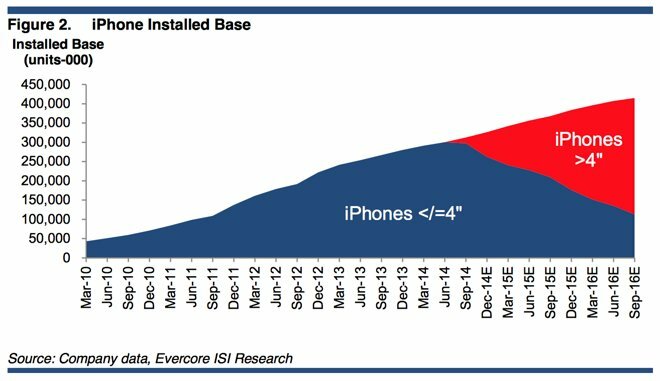 With a huge number of iPhone owners yet to upgrade to screen sizes larger than 4 inches, Evercore Partners expects major revenue growth for Apple in fiscal 2015 and beyond, and has increased its price target on the company's shares to $135. Analyst Rob Cihra issued a note to investors this week, a copy of which was provided to AppleInsider, announcing his revised target, up from a previous prediction of $125. Apple's fiscal 2015 begins with the current December quarter, in which Cihra has predicted Apple will sell 65 million iPhone units. But for him, even more impressive than the 27 percent year over year unit growth that Cihra expects is a prediction that the average selling price of the iPhone will increase by more than $20. This stands in contrast to the broader smartphone market, which is only seeing growth at the low end. Cihra and many others expect that the iPhone 6 and iPhone 6 Plus will increase the average selling price of the iPhone thanks to the $100 premium for the 5.5-inch model, as well as the elimination of the 32-gigabyte storage capacity, offering instead 64 and 128 gigabytes on higher end models and incentivizing storage increases for new buyers. The analyst's predictions call for 43 percent of the iPhone install base to still be using screen sizes of 4 inches or less by the end of fiscal 2015, which runs through the end of September of next year. With an extremely loyal user base, Cihra believes that almost all customers will eventually upgrade, which bodes well for Apple's growth beyond 2015. 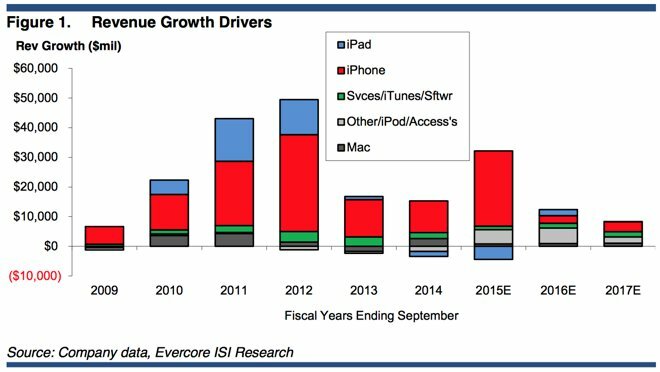 And while Apple's revenue was up 7 percent year over year in fiscal 2014, Cihra believes revenue growth will reaccelerate in fiscal 2015, growing 15 percent year over year. Of that growth, he believes about 90 percent will be driven by the iPhone. But he also has high hopes for a rumored new, larger "iPad Pro," as well as the upcoming Apple Watch set to launch in early 2015.